In everything we do, we are governed by rules that have been set up by society to keep things running smoothly. I’m not sure who in antiquity set up the original rules, but most of us seem to have at least a vague awareness of them and follow them without question. Call it instinct if you will. In the realm of romantic pursuit, for example, the rules are simple, but very strict. The man chases the woman over an unspecified period of time. This process continues until she decides to catch him. But it is absolutely essential that he have no idea of this second facet or the rule. He must forever think he was in absolute control of the pursuit all along. It’s not just in romance; everything we do in our lives follows pre-set parameters. When you go to see a doctor, for example, the rules are simple. You tell him what is wrong, then just step back and listen. After all, he is the expert. You would think this is even more critical in emergency situations but recently I watched as a small woman, unhappy with how the team of doctors was addressing her very sick husband, took over and started demanding a series of things be done. For some reason I still don’t understand, she got her way. A few weeks later, I saw how each of those same doctors had come to love and respect that woman because of, or maybe in spite of, her role in creating a positive outcome from a dangerous situation. I thought about that for quite a while and it eventually became apparent to me that while most of us follow the rules, there are a few people who don’t. This woman’s choice to battle against the rules, and the people in authority, turned out to be heroic behavior. And all parties concerned came to appreciate it—after the fact anyway. 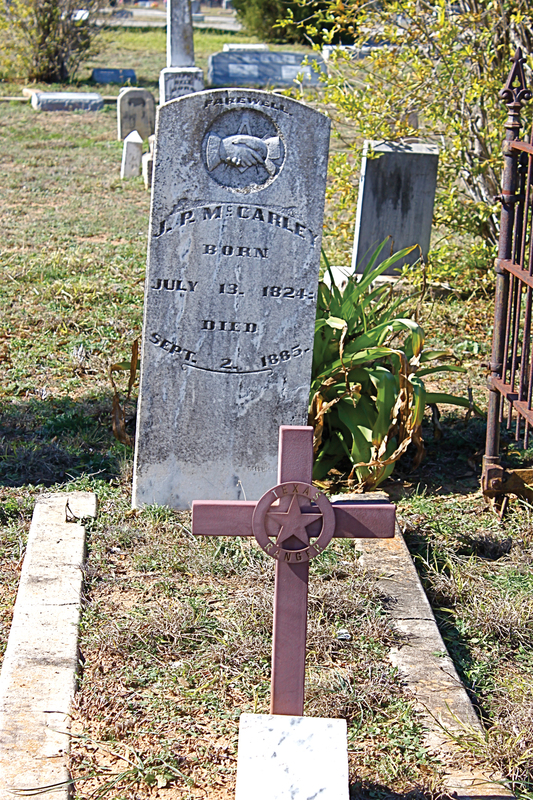 I was in the Mount Hope Cemetery in Carrizo Springs. I had made the journey because I wanted to find the graves of the old Texas Rangers that I heard were buried there. Ranger graves are marked with the circled star of their order. Since most of these graves were from the late 1800s, the markers are now weathered and covered with rust but they still stand out as special among the other graves. I’ve always been fascinated by the stories of the old Rangers, from Bill McDonald’s famous “one riot; one ranger” story on the positive side, to the atrocities that have been attributed to some of their ranks (such as Leander McNeely’s executions). This intermingling of the heroic and the villainous intrigues me. Many years ago, when I was still in college, I read a newspaper story about the death of a fellow I knew in high school. Back then he was a hoodlum. He was well-known for administering beatings and otherwise terrorizing the smaller and weaker classmates, even some as much as four years younger than he. He spent most of his high school life in trouble. According to the article, he died trying to save a child who had fallen on a set of railroad tracks just as a train was approaching. He didn’t know the child but jumped in anyway. He managed to push the boy to safety seconds before the train dispatched him. He apparently forgot the rule about not standing in front of oncoming trains. As a result, our high school villain died a hero. That started me thinking. What goes on in a person’s mind that can cause him to act the parts of a hero and a villain both? I think the answer may lie in the root cause of both behaviors. The two traits may have a common source, a single cause if you will. It is sort of like the black and white yin and yang diagram from eastern cultures, with one major exception. Though intermingled, yin and yang are true opposites; they interact with each other yet they are always separate. In the diagram, there is either black or white. There is never a gray. Heroic and villainous behavior patterns, on the other hand, aren’t really opposites. They don’t just interact like yin and yang; they can blend. I think that may be because they are really the same thing—two sides of the same coin. Consider for a moment the concept of love. Ask most people you know what is the opposite of love and almost without exception, they will answer hate. But really, when you think about it, aren’t love and hate really the same thing—a strong emotional attachment to someone or something? Yes, one is a positive attachment and the other negative, but they are both a form of interdependence—of continued emotional involvement. In reality, the true opposite of love is indifference. I think the same is true of heroes and villains. At their root, both are a function of a single personality trait: anti-social thought and behavior. For some reason both heroes and villains are prone to habitual violations of the rules society sets up to govern the things we do—the rules that most of us follow. There are some people who just refuse, or are constitutionally incapable, of following those rules. Whether the person breaks bad or good, becomes a hero or a villain, the cause and process are the same. Sometimes, as in the case of my high school classmate, both results can co-exist in the same person giving further evidence that the two are just manifestations of the same concept. For me, the Texas Rangers certainly exemplify that notion. It takes an unusual kind of person to seek out the life of hardship and danger the 19th century Rangers led. These were men who, by virtue of their career choice, showed that they were not governed by the same set of norms or rules that guide you and I. Some were heroes and some not so much. Unlike my classmate, or the woman in the hospital, I don’t think I’ve ever been bold enough, or enough of a rule violator, to qualify as a hero or as a villain. Frankly, it is unlikely I ever will be in the future either. I’m just too old to become a renegade now. My wife calls me “Crunchy Granola” because I always color between the lines. But just between you and me, it really has not always been quite that clear cut. Over the years I have observed and sometimes even experimented a bit with this concept. After all of that, I have come to only one conclusion. Rules were meant to test the creativity of intelligent people. I probably shouldn’t say any more than that. I enjoyed reading this article. Michael Gos makes a good point about the relationship between love and hate. I agree. As always, well written and interesting. Since the cultural revolution of the 1960s, many more people seem to think they need to violate the rules. Sometimes this is good and sometimes bad. Coming from a supreme rule violater, I hope it is used for good and, well, let’s call it fun! I love these articles and all of the thought and foresight that come with them! I am si glad that woman stood her ground and did what was right for the patient-and saved a life!! !